Immigrants from all over the world — China, Russia, India, Italy, Venezuela — gathered at the First United Methodist Church in downtown Austin on a recent Monday with a shared goal: learning English. As the state's demographics shift, the number of languages spoken in Texas households is growing — up to 164 in the last U.S. Census count. So are the challenges associated with providing educational services to an increasingly diverse state population. Of the 23.7 million people in Texas who are five years of age or older, more than a third speak a language other than English at home. A large majority of those — almost 85 percent — speak Spanish. But changing immigration patterns are increasing the number of other foreign languages spoken in Texas households, from Vietnamese and Chinese to Tagalog, the language spoken in the Philippines. 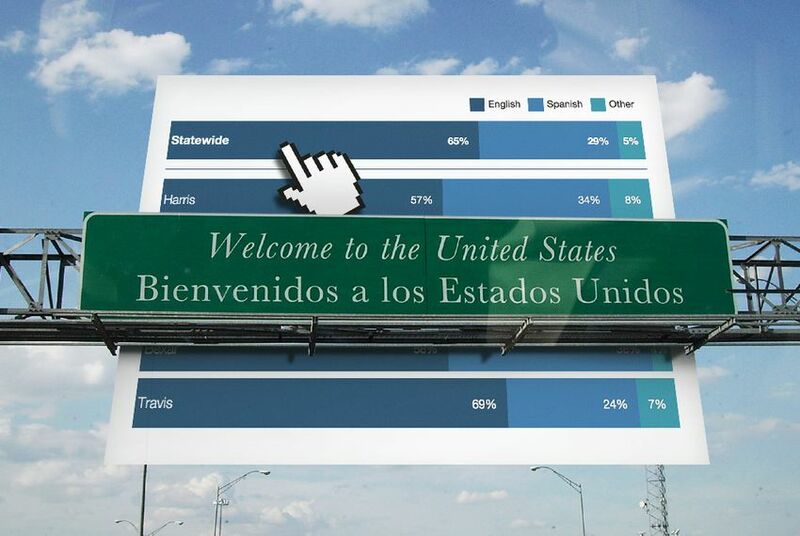 Texas has seen dramatic fluctuations in the origin of its incoming immigrants in the last decade. Though people born in Latin American countries continue to make up the largest group of immigrants in Texas, their share has decreased from 69.4 percent in 2005 to 42.9 percent in 2013. Meanwhile, the share of Asian immigrants to Texas has more than doubled, from 17.3 percent in 2005 to 40.4 percent in 2013. Those Asian migrants have not dispersed across the state in equal numbers; they've largely settled in the state’s big metropolitan areas, like Harris, Dallas, Tarrant and Travis counties — what Potter calls "little enclaves of language concentration." Compared to the state overall, those four counties have a larger share of residents who speak languages other than English or Spanish at home. Among the major metropolitan areas, Bexar County has the largest share of residents who speak Spanish at home, while Tarrant and Travis counties have the smallest shares. That means English as a Second Language (ESL) classes like the one at First United Methodist Church in Austin are more likely to enroll immigrants who speak neither English nor Spanish at home. “People tend to think when we say ESL class, ‘Oh, you have people from Mexico,’” but Spanish-speakers only make up a fourth of the students, said Catherine Bingaman, the church’s director of ESL education. At First United, ESL classes are largely made up of immigrants from Asia, the Middle East and Europe, and cite employment as the main reason they are working to improve their English, Bingaman said. In the Houston area, a common immigrant resettlement spot, public schools face some of the toughest challenges associated with a growing number of spoken languages. In Fort Bend County, which has been called the most ethnically diverse county in America, the school district is charged with educating children who speak up to 100 different languages at home. Only 17 percent of the Fort Bend Independent School District’s student population is white. Asians and Middle Eastern students make up a quarter of the student population; of the remaining students, half are black and half are Hispanic. District administrators say this demographic breakdown has prompted them to offer ESL courses at all but a handful of campuses, consider bilingual skills in hiring of faculty and staff and invest in ESL certification for teachers. With a large Asian and Middle Eastern student population — and a correspondingly wide range of languages spoken — parents will often bring their own translators when meeting with teachers or school officials, said Lupita Garcia, the district’s senior executive director for federal and special programs. “It brings very unique challenges to us in that respect," Garcia said, "because there’s also the cultural divide in learning as well as language [and] communicating with the parents about our culture, our schools and our expectations."